Hey, guys in this article, we have present you the tutorial to transfer the files between Android smartphone and computer using WiFi without the dispute of having to look for a USB cable or removing the SD Card from your Droid. Numerous methods are available to get files to/from your Android device to computer. But this is one of the easiest method you could find. In this method you will use the WebSharingLite app. It lets you to connect your android device and computer via the WiFi network in your home and/or office. Absolutely you will not need any set up, just run the WebSharingLite app and it tells you exactly what to enter into any web browser’s URL bar to get there. You will then be able to download or upload any files you want. First download the WebSharingLite app from here. Then Install the same by NextApp, Inc.
After that launch the app and click on the start button at the bottom left. WebSharing will then be activated and you can go to your PC and type in the URL displayed on the screen into your web browser. If prompted, enter the password listed on the screen. That’s it! After that you can easily transfer the files you want. 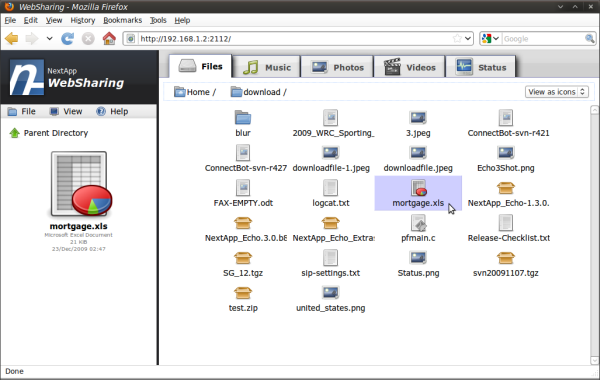 If the WebSharingLite app doesn’t work properly you can also try the Wifi File Explorer app.